Pumpkin Decorating, Halloween, Recipes, and More in This Twitter Party! It’s been a while since we’ve held a Twitter party here at FaveCrafts so we thought it was about time. What better occasion to celebrate than Halloween? We’ll be gathering in the Twitter-sphere on October 17th at 3pm EST to talk about crafting for Halloween, pumpkin decorating ideas, and fun Halloween themed recipes. Join us with your questions and ideas! There’s still plenty of time to pull some great ideas for you Halloween parties. We’ll also talk about pumpkin decorating ideas, so if you’ve still been searching for the perfect idea to decorate your pumpkin and submit it to our Pumpkinpalooza contest this could be the time! Personally, I have a slew of pumpkin carving questions. I bet some of you could answer them! 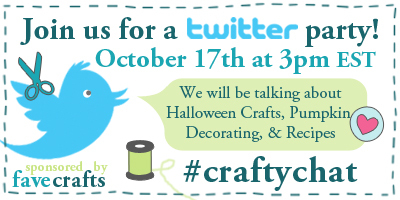 All you have to do to participate is sign into Twitter on October 17th at 3pm EST and search for the #craftychat hashtag or sign into Twebevent with your Twitter account to follow the conversation. To join the conversation be sure to use the #craftychat hashtag in your posts. If you’re using Twebevent, you don’t have to add the hashtag the site will automatically do it for you. Never participated in a Twitter party you say? No worries! We’ve pulled together a blog post that explains it all. Just joining in on the chat gives you an entry into our giveaway! The more you join the conversation, the more chances you have to win. We’ll be giving away a Funkin, some Energizer Flameless candles, and a Halloween costume book! If that’s not incentive to join in, I don’t know what is. Contest closes October 17, 2012 at 4:00p EST. Send out a tweet along with the #craftychat hashtag in order to be entered. Winners will be announced at the end of the chat. Pumpkins are so popular during the fall season. It seems like there’s always people carving them up or using them to cook. It’s no wonder the pumpkin seems to be a symbol for all things fall. Here at FaveCrafts, we couldn’t be more excited, because this means we get to provide all of you readers with a special treat. Not only will we be featuring our favorite pumpkin projects from our sites, but also some scrumptious pumpkin recipes from our friends at RecipeLion. Not only will you be busy crafting this season, but now you’ll have delicious recipes to keep you even busier. Oogie Boogie Pumpkin Pattern Template – This project from AllFreeHolidayCrafts brings to life a classic Halloween baddie from The Nightmare Before Christmas. 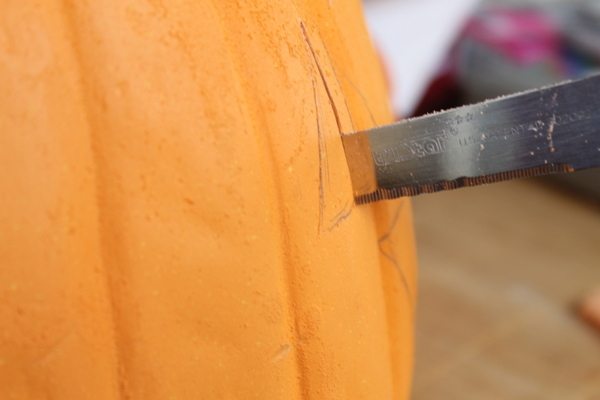 If you’re looking for a more challenging pumpkin carving design, then you have try this. Crochet Pumpkin – It can be difficult to find time to go pumpkin picking once fall comes around, but don’t worry, because AllFreeCrochet has the solution. 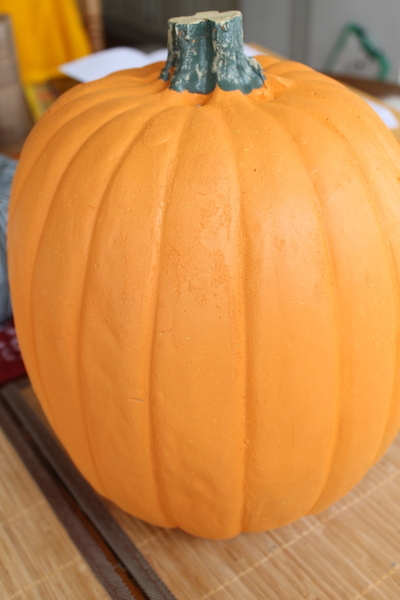 You can make your own pumpkin that will last much longer than one year, and with your crafting skills, it’s sure to be the perfect shape and size for your home. 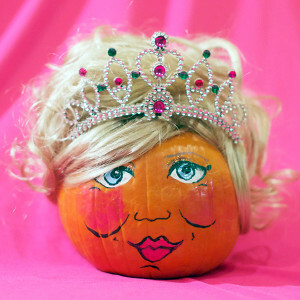 Cinderella’s Pumpkin Coach – Pumpkin crafts are for the kids too, and AllFreeKidsCrafts found the most magical idea yet. Help them to bring a childhood classic to life by turning a plain pumpkin into Cinderella’s carriage. This project is great for encouraging creativity and imagination. Wacky Pumpkin Mac and Cheese – Any delicious meal needs a starchy side, and this one from RecipeLion will have your family begging for seconds. Take a classic American meal and add some fall flavor that will really spice it up. One Pot Pumpkin Chili – AllFreeCasseroleRecipes has found the perfect blend of heat and sweet with this main course. This is perfect for a chilly autumn evening with the whole family around the table. Caramel Maple Pumpkin Pie In a Glass – Be bold and contemporary with a classic dessert with this recipe from FaveHealthyRecipes. If you’ve got a family that’s always active during the holidays, this is great for on the go. Pumpkin Spice Latte Recipe – Finish off your meal with a refreshing pumpkin drink courtesy of AllFreeCopyCatRecipes. It’s just what you need to hit the spot on a cold night. With these pumpkin projects in your arsenal, you’ll be busy practically every day during the fall. These projects are just the beginning, so be sure to check out the rest of our pumpkin delights on our websites. What’s your favorite way to use a pumpkin? No Carve Pumpkin Decorating Ideas + Pumpkin Decorating Contest! As many of you may be aware, we are having a super prize-filled pumpkin decorating contest! If you haven’t checked it out or entered yet, please do! We’re loving the entries that have come in so far and are so excited to see what else you guys come up with. If you’re still coming up with pumpkin decorating ideas or are at a loss for what to submit, we’ve come up with a few things for you! One of our sponsors for this contest happens to be Funkins! Have you ever used a Funkin? They’re great because they’re fake carvable pumpkins, which means no throwing away all that work you put into decorating it in the first place and (probably most importantly 😉 no raccoons or other small animals destroying your jack-o-lanterns! They even have galleries full of pumpkin carving ideas if you’re not sure what to do with a Funkin. 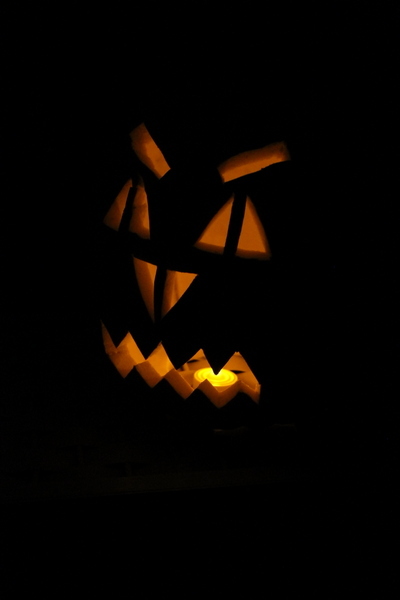 However, if pumpkin carving is not your thing and you still want to enter our contest no worries! 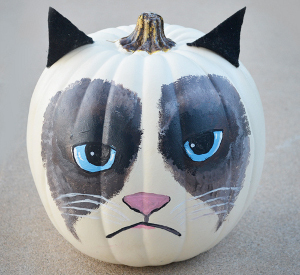 We’ve got some no carve pumpkin decorating ideas for you. Love robots? Love pumpkins? Then this Robot Pumpkin decorating idea is a win-win for you. And if you use a Funkin you can save this little cute for years to come, or just keep him around year-round. Who said all decorated pumpkins had to be spooky? This one is Halloween ready because he’s wearing a costume. Looking for something a little spookier? This black cat idea that uses two pumpkins definitely fits the Halloween spirit. If neither of these fit your tastes, we’ve got 18 more no carve pumpkin decorating ideas right here. SO grab your yarn, paints, and Funkins and get to decorating so you can try and win that $400 first prize! How to Carve a Funkin + Pumpkinpalooza Contest! To celebrate our Pumpkinpalooza contest, we’re bringing you the best flameless candle and pumpkin projects from all of our crafty friends! Scroll down to the bottom of this post to find out how you can win $1000 in cash and prizes just by decorating a pumpkin! 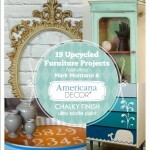 This post comes from Angie of The Country Chic Cottage. 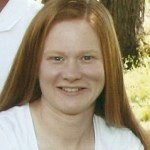 Learn more about Angie and check out all of her projects on AllFreeHolidayCrafts. Carving a Funkin is a great activity with any child this Halloween. Funkin? Yes that is right! 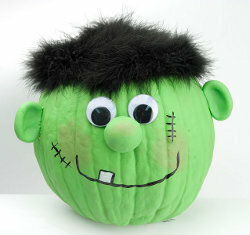 Funkins are artificial pumpkins that are carvable. 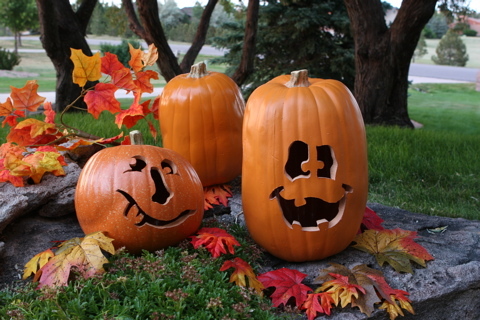 Carve them just like a regular pumpkin but they will last forever. Plus they are so much fun and you can get a little silly with them…. 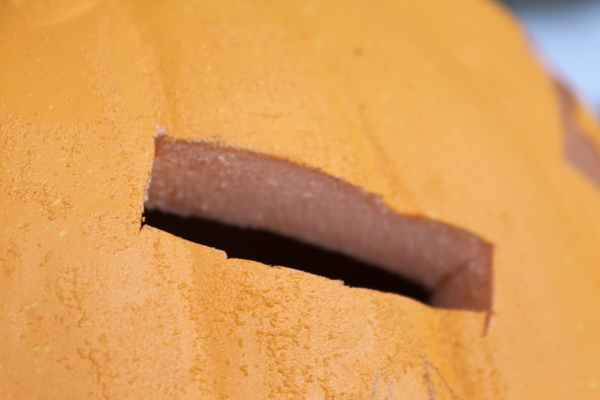 The Funkin looks like any other pumpkin…except there is a hole in the bottom and no seeds. Not even any of that slime to clean on the inside. You can just jump right into the fun part. 1. We started by sketching on a face (designed by a 7 year old) with a pencil. My 7 year old wants to put our Jack-o-lantern in his room every year. Now with the Funkin that is possible! 2. We then just used a knife (no special tools) to cut out our face. It really was just as easy as carving a real pumpkin. 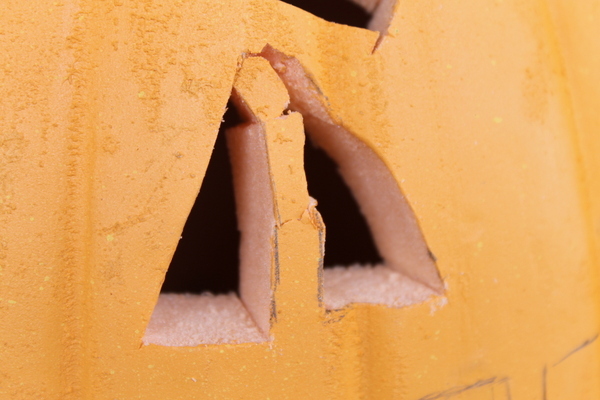 Now you can see that the inside of the Funkin is similar to styrofoam. I even let my son carve some (supervised of course). We had one mishap but a little glue fixed this area right up. I would say if you can make these thin areas of your design a little thicker they will work better with the Funkin. 3. After you have made your cuts, you can actually erase all of the extra pencil marks. They just came right off! This is the only mess we were left with. A few bits to throw away and a little dust. So simple, easy and fun! 4. You just add a light to the inside and you are ready for some Halloween fun. I just added a battery operated tea light and it was perfect. My son loves the new addition to his room. And now the Jack-o-lantern can stay outside where he belongs. How creative can you get this Halloween? Enter our Pumpkinpalooza contest and show off your creative skills! You don’t have to get out a knife for this contest – show us what you can do with Mod Podge, paint, paper and more! 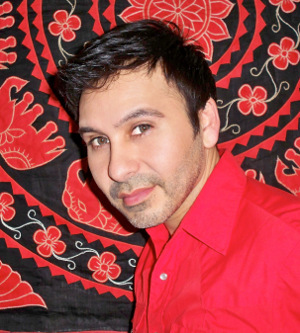 Entries will be judged by Mark Montano, Margot Potter and the Crafty Chica, Kathy Cano-Murillo. If that wasn’t cool enough, the winner will received $1000 in cash and prizes! 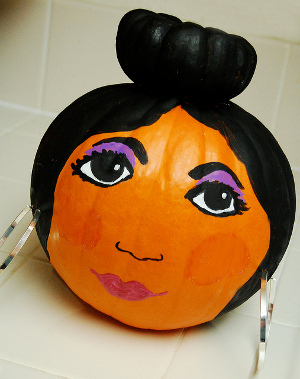 Submit you photo of your decorated pumpkin at FaveCrafts.com. Contest submissions will be accepted September 24th through October 21st. Only one submission per person please, so use your best pumpkin decorating ideas. You must use a pumpkin. You can decorate the pumpkin any way you like, but there must be a pumpkin, real or artificial. We recommend using a Funkin, so your creation can be displayed year after year! Craft-lebrity voting will be from October 22nd to October 24th. The judges picks will then be opened to reader voting from October 25th to October 30th. Winner will be announced on the Halloween, October31st! One entry per person, duplicates will be deleted. Contest entries close October 21, 2012 at 11:59p CST. Entries must be submitted at FaveCrafts.com. Entries must be an original design by you. Winners will be posted on this blog Wednesday, October 31st and notified by email. No Carving Needed: Enter our Pumpkinpalooza Contest! Do you love Halloween as much as we do? Are you excited for pumpkin carving and apple cider? Well get even more excited because we’re calling all pumpkin decorating fanatics to put on your thinking caps and gather your best pumpkin carving designs and pumpkin decorating ideas and enter our Pumpkinpalooza pumpkin decorating contest! We want to see your most creative pumpkin decorating ideas! Not planning on carving a real pumpkin this year? That’s not a problem because we want to see you use all your crafty skills and that includes pumpkin decorating without carving. So put on your thinking caps and get out the scissors, Mod Podge, yarn, or paint and get crafty! We’ve pulled together an amazing prize package and a panel of craft-lebrity judges to help us pick the winner in our pumpkin decorating contest! After submissions are over, your pumpkin will be judged by Kathy Cano-Murillo aka The Crafty Chica, Mark Montano, and Margot Potter, a Craft Wars alumni. The judges will be picking the top 10 pumpkin designs and then YOU, our readers, will be choosing the winners. So be sure to check back and vote on your favorite or get your friends to vote if you’re in the finals! Of course you didn’t think we’d run a contest on FaveCrafts and not have some amazing prizes for you! Our sponsors, Funkins Pumpkins and Energizer are making sure the winners go home happy! 1st Prize – $400 cash prize and Energizer Flameless Candles valued at $100. 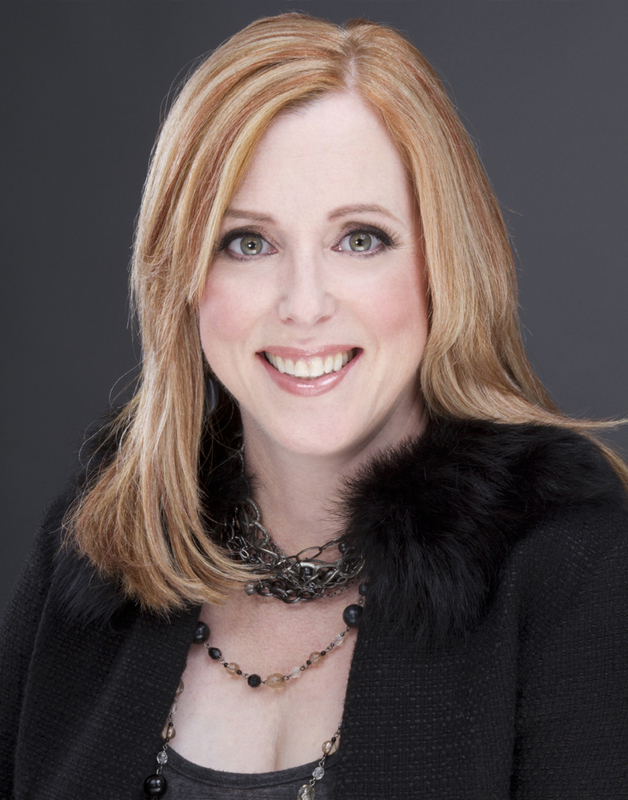 2nd Prize – $250 cash prize and Energizer Flameless Candles valued at $100. 3rd Prize – $150 cash prize and Energizer Flameless Candles valued at $100. 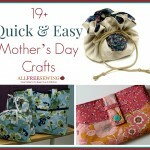 Want to see your design featured on the homepage of FaveCrafts? All you have to do is submit a photo of your pumpkin project with a materials list and instructions and we will post it on our site. Then you will see that project right on the homepage for everyone to find. In order to have your project tutorial featured on the site, just submit it to customer.service@primecp.com. My favorite part about Halloween is decorating pumpkins! I usually can never come up with a fun design when I need to, and I end up just carving out the classic chunky smile and triangle eyes. How boring. This year I vow to try something more creative for sure. Join me? 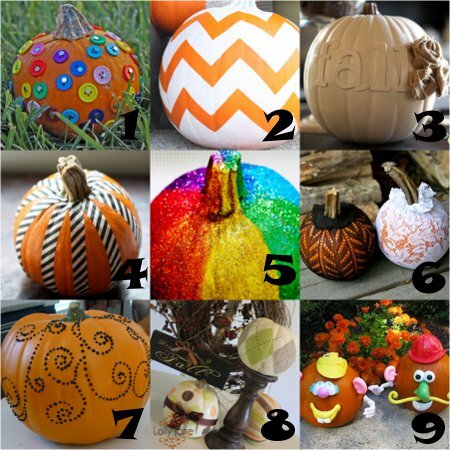 We can start by looking at this great guide, 17 Pumpkin Patterns: Free Projects for Halloween on FaveCrafts. I’ll talk about a few of these projects, but there are many more to check out. 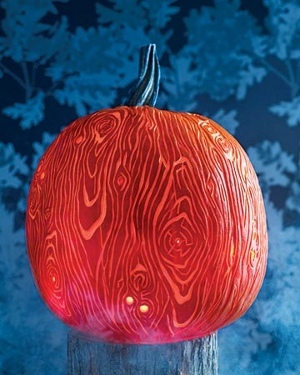 Remember, you don’t have to actually “carve” a pumpkin to create fantastic Halloween decor. Plus, I really don’t like pulling out all that pumpkin goop and slimy seeds. Blech. 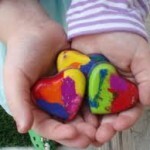 But, I think I would sacrifice clean hands for Cinderella’s Pumpkin Coach from AllFreeKidsCrafts.com. I once made a version of this idea for a pumpkin decorating contest with my college equestrian team. And we won! We even painted gourds to look like the horses that pull the pumpkin coach. 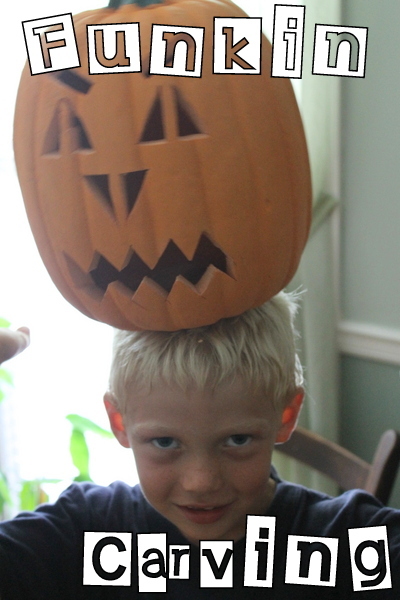 I wish we had thought to use a crown on top of our pumpkin – it is the perfect touch. One of these things is not like the other…one of these things doesn’t belong…can you spot it? I just couldn’t resist showing you the Clementine Jack O Lanterns. 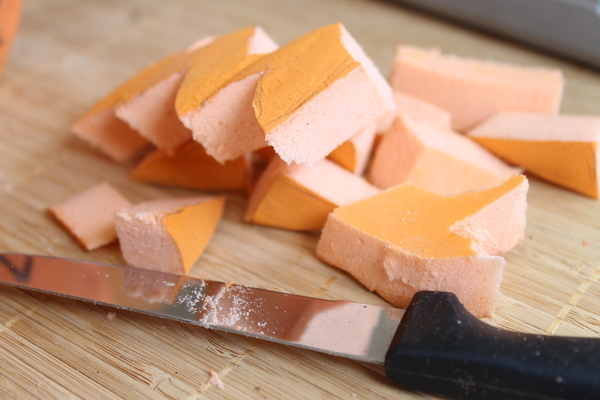 They make perfect lunch treats that are way healthier for you than candy. I know a lot of elementary schools have Halloween classroom parties, and these would make an adorable snack platter. You could even carve a watermelons and apples! Sometimes I like to be super artistic with projects like these. But the unfortunate problem is that pumpkins go bad, and I don’t like to see my hard work go to waste so quickly. 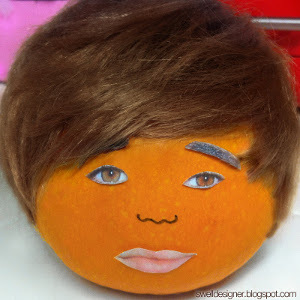 I can’t express how glad I am that artificial pumpkins exist – my creations can last forever! Okay, not forever, but much, much longer than a real pumpkin. There are some amazing designs out there, but I especially like these Pumpkins in Silhouette. There is something so elegant about silhouettes. 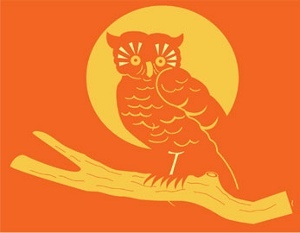 Plus, I love owls and they are perfect for fall decor. Let your imagination run wild with these pumpkin patterns! Which do you prefer: carving pumpkins or painting them? Whether you’re living with little kids or you just like your pumpkins to last a little longer in the fall, these no carve pumpkin ideas are great for Halloween and beyond! The great thing about not carving your pumpkins is that they can be displayed outdoors and indoors. They last much longer than carved pumpkins and open the door for endless possibilities for crafty minds of all ages. You could also use fake pumpkins so they’ll last year after year! I love these Bedazzled Pumpkins. They’re perfectly classy for Halloween parties and even weddings! You could paint a few of them white for an elegant and sparkly black and white party. 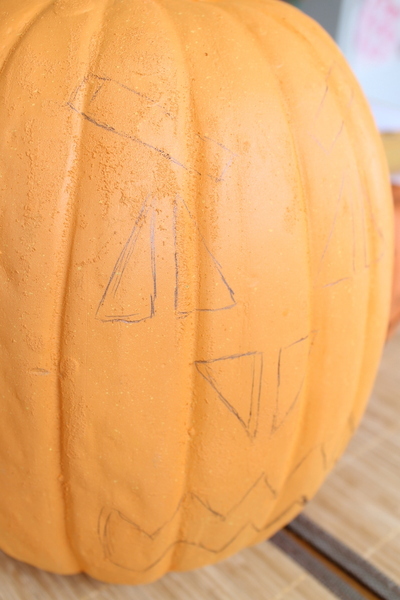 This is a great project for kids since there’s no carving involved. For the more advanced crafter, this Owl Pumpkin is a great project to have on display in the fall. He can sit outside your home and guard your house or you can keep him inside to set the mood for Halloween! 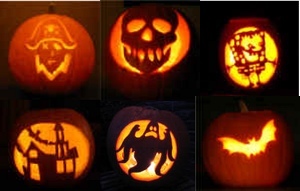 And thanks to all our crafty Internet friends, we have lots of other no carve pumpkin decorating ideas for Halloween! Which one is your favorite? It’s almost Halloween, which means it’s time to start thinking about what you want your pumpkins to look like this year! I used to enter my pumpkins in pumpkin carving contests when I was a kid, so I was always on the lookout for unique pumpkin carving patterns. Free ones were hard to come by back then though! I scoured the web for you (thanks, Google!) and found a ton–and I mean a ton–of pumpkin carving patterns, free to download, print out, and start using! If you click over to DLTK’s Crafts for Kids, you’ll see even more printable templates, including instructions for how to use them. They’ve got a good mixture of scary and silly. I didn’t include the scary clown pattern in the photo in case you guys are scared of clowns! But check it out at DLTK. 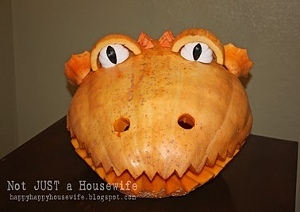 I had to include this dragon pumpkin in this round-up, from Not Just a Housewife. There’s not a full tutorial, but if you found the right pumpkin I bet you could recreate this easily. 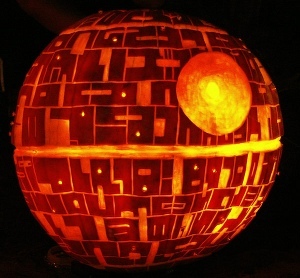 All of you Star Wars nerds out there will appreciate this pumpkin carved into the Death Star! The designer even includes a tutorial for how to make your own. 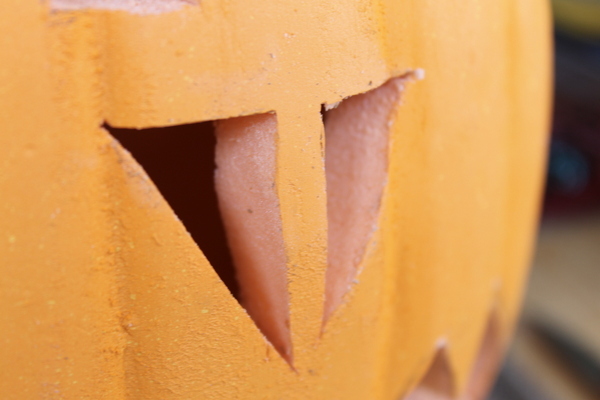 Check out the rest of his site for even more pumpkin carving patterns, free for the taking. And in case these aren’t enough for you, you can get even more pumpkin carving patterns free from HGTV, Family Fun, and The Pumpkin Lady. Are you a pumpkin connoisseur? 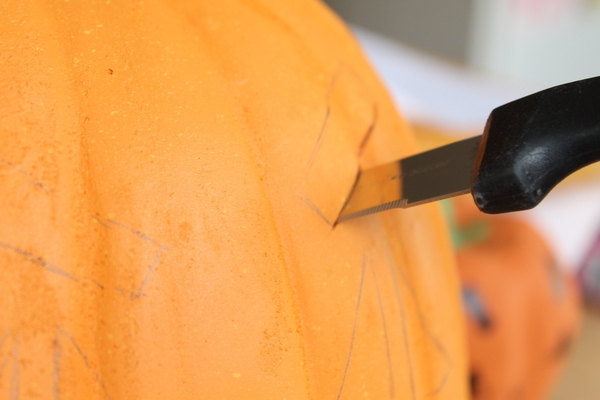 What’s the most ingenious pumpkin carving idea you’ve ever tried? Halloween is almost here, it’s my favorite time of year; the costumes, the candy, the decorations and the pumpkins. Festive colors and shades of orange are sprung about and put a smile on my face. My favorite part is all the pumpkin patches and apple cider. Pumpkin picking can be made into a long and wonderful day then you have all these options of what to do with your pumpkin. How to decorate a pumpkin you ask? You can carve it, paint it or just simply decorate it with anything you wish. Carving pumpkins is always a tradition for me. When I was younger all I did was the simple face with two triangle eyes and a squiggly mouth, but now that I’m older, I’m getting more creative. I’ve started buying those pumpkin carving kits, although it’s considered “cheating” it’s not all that easy to do. The package comes with this tiny little carving knife which takes forever to actually cut your pieces out. I like making some kind of crazy pattern like a cat face or a ghost with a house in the background. It’s time consuming, but it makes for a great decorative piece once you put a candle inside. 1. Prime pumpkins with Multi-Purpose Sealer. 2. Basecoat round pumpkin (the bottom pumpkin) with Razzle Berry and wide bottom pumpkin with Purple Cow. 3. Mix small amount of Razzle Berry into Purple Cow. Paint oval on Purple Cow pumpkin for nose. 4. Use liner brush and Lamp Black to paint mouth. 5. Mist pumpkins with Americana Matte Spray Sealer. 6. Position and adhere googly eyes and chenille stem antennae. 8. Tie or glue wings onto back of body. Some other ways to paint and decorate a pumpkin is to make something crazy with it like a witch teapot. This is such a neat way to decorate your festive pumpkin. It’s hard to tell if it’s actually a pumpkin or a teapot. Once again, you can use googly eyes, paints and foam letters. This witch pumpkin takes a while to put together, but once it’s done, all your trick-or-treaters will be intrigued. Don’t think that because you went to a pumpkin patch you have to actually carve your pumpkin. There are plenty of other things you can do with it. 4. Or you don’t even have to use real pumpkins; you can decorate foam pumpkins or mosaic pumpkins. 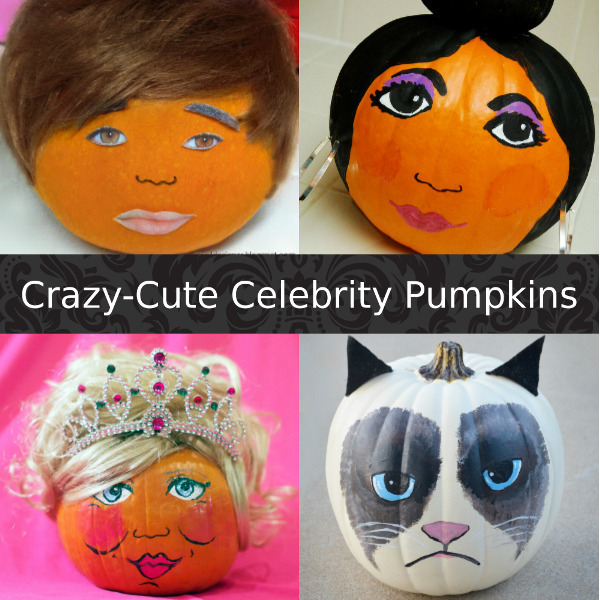 Check out all the no-carve pumpkin ideas here!